What is a Stock Repurchase Agreement? What is a stock repurchase agreement template? A stock repurchase agreement is an agreement that is used when stocks are being sold from one person or company to another. 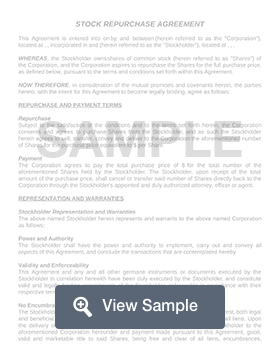 The stock purchase agreement states that a company can buy back its stock at a later date. There will be many aspects covered in the agreement, such as price for the stocks, the date of the sale, and who is going to have ownership of the stocks. Since a stock repurchase agreement often deals with confidential information about a company or business, it is important to include an area about retaining confidentiality during the agreement. Legal counsel can help you decide if a confidentiality clause should be included in your agreement. This agreement will include various information about the value of the stocks and payments. The contract will also include representations and warranties on behalf of both parties indicating that they are legally capable of completing the transaction. Be sure to list what the purchase prices of the stocks is and how the amount is going to be paid by the purchasing party. 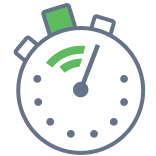 Create a free Stock Repurchase Agreement in minutes with our professional document builder. How does share repurchase work? What are the components of a stock repurchase agreement? Why would a company buyback its own stocks? A company may choose to buy back its shares if the management believes that the shares on the market are undervalued. If the company repurchases some shares, the shares that remain on the market can increase in value. A share repurchase agreement is sometimes used as an alternative means of delivering profits to the shareholders. If a company repurchases its own shares, there are fewer shares left on the open market and those remaining shares will receive increased earnings per share.